UK defence and aerospace group BAE Systems has confirmed it is in discussions to sell its 20% stake in European aircraft-maker Airbus. As expected, it is holding the talks with EADS, the Franco-German group that owns the rest of Airbus. "Discussions are at an early stage and a further announcement will be made if and when appropriate," said BAE. It added that there would be no implications for Airbus' 13,000 UK staff if and when a sale goes through. Airbus' UK operations design and build wings for its fleet of large commercial jets. The sale would mean there would no longer be any British ownership of the huge manufacturing sites at Broughton in North Wales and Filton near Bristol. BAE is expected to pocket up to £3bn ($5.25bn) from the sale. Its chief executive Mike Turner confirmed that the firm wished to renew its focus on its core defence business, which is rapidly growing in the US. "We believe that now is the right time for us to divest our Airbus shareholding to allow us to concentrate on our core transatlantic defence and aerospace strategy," said Mr Turner. Despite BAE's assurance that the UK Airbus workforce will not be affected by a sale, unions said they were still concerned. "We want to find out if production will remain in the UK or whether it will be shifted to countries where the new buyers are based," said Ian Waddle, national officer of the Amicus union. 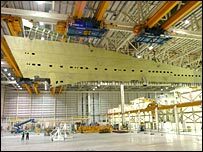 Airbus recently announced the creation of an extra 650 jobs at the Broughton factory in North Wales - the region's biggest manufacturing site with 6,000 staff. As well as the staff directly employed by Airbus in Britain, as many as 135,000 jobs at UK suppliers are thought to depend on it. Airbus sold a record 1,055 planes last year, giving it a larger share of new orders than US rival Boeing. The Airbus range includes the A350, launched in October last year and due to enter into service in 2010. Earlier this week, Airbus unveiled the A350's new interior, designed in collaboration with London-based firm Priestman Goode, at a trade fair in the German city of Hamburg. Despite a bumper year for Airbus sales in 2005, BAE's commercial aerospace division saw its overall profits fall to £179m from £201m a year earlier because of weak demand for its regional jets. BAE's move towards concentrating on its defence operations was reflected by last year's acquisition of US firm United Defense for £2.1bn. Its American operations now account for 35% of BAE's total £14.8bn annual sales. BAE employs 90,000 people globally. Do you work for Airbus in the UK? If so, we'd like to hear from you. Contact us using the form below.